The inclusions on the lower on the sample give it a rude aspect. In spite of this the color is magnificent, with beautiful orange reflections, very well shaped and gemmy on its termination. 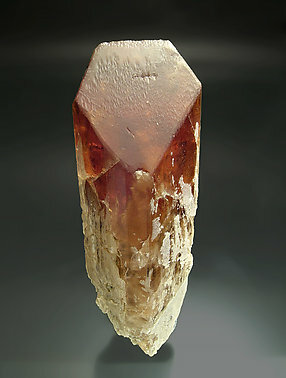 The crystals of Danburite are completely clear and form a contact visible both for the form of wedge on the termination and the fine suture all along the prism. 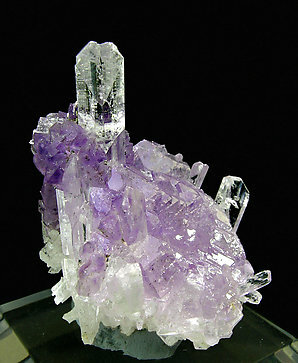 The group is densely covered by amethyst crystals of excellent color. The specimen has been reviewed, photographed and published as a new discovery in the magazine ‘‘Mineral Up’’ on page 28 in number 2006/2. The sample is very esthetic, formed by prismatic crystals of Danburite, one of them clearly dominant, with very sharp faces and edges and clear terminations. 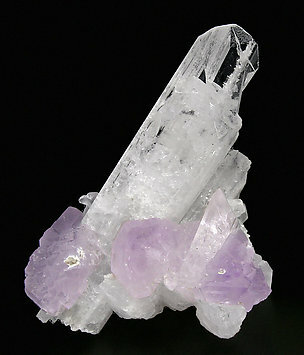 On the base of the specimen there are groups of amethyst Quartz of a nice color, contrasting with the white Danburite. This sample has been reviewed, photographed and published as news from Ste. Marie 2006 by the magazine ‘Le Règne Minéral’ on page 47, number 70.